I know a lot of people might view this as an advertisement, but that is not at all what I intend it to be. Vendor Hippo is a company that I have been fortunate enough to start working for. We are a farmers market & agriculture multi-media and market management company. We offer a wide variety of services, including video production, vendor services, advertising, graphic design and more. We love Colorado and believe in supporting our local economy! 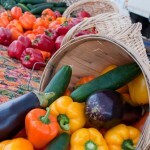 Farmers market popularity has skyrocketed over the last few years. People are becoming increasingly more aware of the food they put in their mouth. People are sick of chemical-laden food and big corporations dictating what they can eat. Also, people are becoming more and more conscious of eating locally and purchasing products that help sustain their local economy. 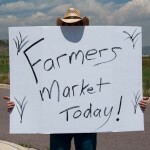 Since 1994, the number of farmers markets in the US has grown from 1,755 to well over 5,000! This is a trend that will continue to grow as more people look for alternative food sources. It is really exciting for me to be working with such great people at the Hippo. It has allowed me to become more involved with the markets and Colorado agriculture and gives me the opportunity to work in an area I am passionate about. Who is that strange guy behind the sign? Why is he hiding?